Coverage: Watch live coverage of selected days on BBC Red Button, BBC Two, online and BBC Sport app. Full details. Mark Cavendish has pulled out of the British team for next week's UCI World Road Race Championships after failing to recover from a shoulder injury. 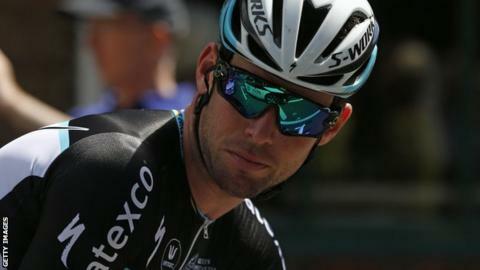 The 30-year-old, who won the road race in 2011, suffered the injury in a crash on stage six of the Tour of Britain. GB team director Shane Sutton said: "It is a blow as he had a great chance." Adam Yates has been added to the squad after the withdrawal of Geraint Thomas. The World Championships are being held in Virginia, USA, from 19-27 September. Welshman Thomas, who finished 15th in this year's Tour de France, withdrew on Monday, saying he did not feel "physically" up to it after completing the Vuelta a Espana. Two-time Tour de France winner Chris Froome is also absent after breaking a foot in the Vuelta. Lizzie Armitstead, who last month won her second successive World Cup, leads the British women's team, which also features double world junior champion Lucy Garner. In the individual time trial, four-time national time-trial champion Alex Dowsett goes in the men's race, with Hayley Simmonds making her GB debut after winning the women's time-trial title in June. Ian Stannard, Adam Yates, Ben Swift, Stephen Cummings, Andy Fenn, Luke Rowe, Scott Thwaites, Alex Dowsett. Lizzie Armitstead, Lucy Garner, Alice Barnes, Molly Weaver, Jessie Walker, Hayley Simmonds.